Nothing turns me into the Grinch faster than having to deal with traffic, parking, and crowds, all three of which were present when I went to see Children's Theatre Company's production of the musical adaptation of the Dr. Seuss classic that they premiered in 1994. I stepped inside the theater just as the lights went down and had to find my way to my 3rd row center seat in the dark, only to find it occupied by an adorable little girl who was already enraptured by the show. I found a seat, but needless to say I was in full Grinch mode and it took me a little while to shake it off and get into the show. But the biggest testament to CTC's How the Grinch Stole Christmas is that by the end of the show, the Grinch was completely gone from my heart, and I had a grin on my face and tears in my eyes. I'm certain the Grinch will return to me several times this season, as it does to all of us when dealing with holiday* cards, shopping, cooking, families, traffic, and all of the other stresses of the season. Hopefully at such times I'll remember what the Grinch discovers - that the true meaning of any holiday is the people we spend it with, and a spirit of generosity and kindness to all, even the Grinches in our life. SCROLL DOWN FOR A SPECIAL DISCOUNTED TICKET OFFER FOR CHERRY AND SPOON READERS! This is my third visit to Whoville, and the fourth visit for Reed Sigmund's Grinch. I was lucky enough to have lunch with the green one last week, as a special guest of CTC (scroll down for photos). We watched Reed transform into the Grinch before our eyes via red contacts, green make-up, and furry green suit. Reed was super friendly, especially with the curious children, but something happens when he completes the transformation to the Grinch. He becomes' gleefully mean, and the kids love it. Below follows my review of the show from last year, which is virtually the same this year, with a few tweaks and additions just to keep things fresh and alive. 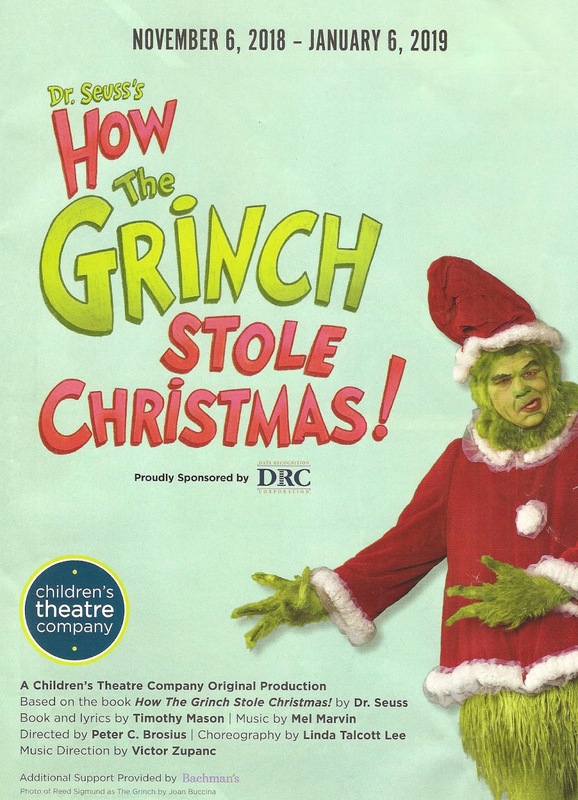 A CTC original adaptation of the Dr. Seuss classic (with book and lyrics by Timothy Mason and music by Mel Marvin), The Grinch premiered in 1994 before moving on to other stages, including Broadway. I first saw it 2014, when I wrote, "it's a bright and colorful, silly and funny, sweet and heart-warming tale of redemption and love." I'm happy to report this is still true, no matter how many times you've seen it. In a less than two-hour visit to Whoville, the show will make you laugh, warm your heart, and hopefully remind you of the real reason we celebrate any holiday - family, friends, and being together. In this musical adaptation, the Grinch's story is told by his dog Max, who is now an old dog ready to move on from the cave in the mountain above Whoville. But first, he shares with the audience the remarkable transformation he witnessed. No mention is made of what has happened since that pivotal Christmas long ago, or where the Grinch is now, but it's a clever device that allows much of the original descriptive rhyming language to be used. Old Max remembers how disagreeable Grinch was when he was an eager young pup, and how he forced him to help steal Christmas from the Whos. The plan failed when the Whos woke up on Christmas day to find all their presents, decorations, and food gone, but still sang and made merry, filled with the joy of togetherness and the spirit of the holiday. The Grinch realized that perhaps Christmas is more than presents and roast beast, his heart grew three sizes, and the rest is history. 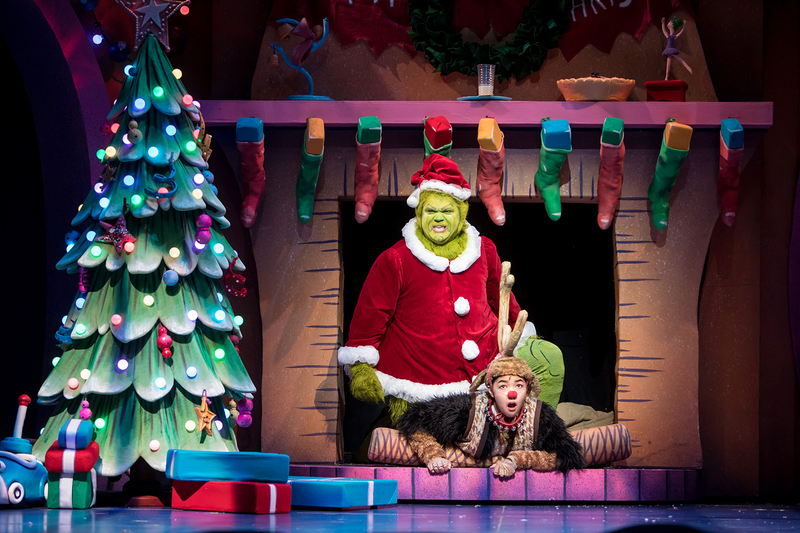 At four productions and about 200 performances, the Grinch is sort of Reed Sigmund's signature role. He puts on role as easily as the costume, to the point where he's totally natural. After so much time with the role, he's has figured out how to milk every word, every moment, every movement of everyone's favorite meanie. It's such a treat to hear him spit out Dr. Seuss' words, or whisper them, or scream them in an audience member's ear. Because watch out, the Grinch walks through the audience at his most mean. But I'm pretty sure being yelled at by the Grinch has got to be the best Christmas present of all. Reed Sigmund as the Grinch is an example of an actor who knows his role inside and out and gives it everything he's got, to the most entertaining effect. The rest of the cast is pretty great too. Natalie Tran returns as young Max, and is an adorably sweet and eager puppy. CTC company member Dean Holt is the older, wiser, slower dog, who narrates the story with nostalgia. The two often mirror each other's movements, showing the connection between them. The entire ensemble of children and grown-ups alike are so joyful and fun to watch as these oddly shaped and colorful creatures, and director Peter C. Brosius and choreographer Linda Talcott Lee keep everything moving smoothly in organized chaos. Last but not least, special mention must be made of Audrey Mojica (new this year) as the purest soul in Whoville, Cindy-Lou, the one who melts Mr. Grinch's heart (along with everyone in the audience). How the Grinch Stole Christmas continues through January 6. Bring your little Whos for a fun and heart-warming holiday treat, or go by yourself - I've learned that it's OK for adults to go to the Children's Theatre by themselves. This Grinch is fun for adults, children, Whos, and furry green grumps. CLICK HERE FOR A SPECIAL 20% DISCOUNTED TICKET OFFER FOR CHERRY AND SPOON READERS! TICKETS MUST BE PURCHASED BY DECEMBER 1. NOTE: the discount will appear on the payment page. If on a mobile device, enter promo code INFLUENCER. FINE PRINT: Limit of 5. Not valid on preview performances. Not valid on VIP, Price Level C, previously purchased tickets or in combination with any other offer. All sales are final, no refunds or exchanges. Other restrictions and fees may apply. Discounts are not transferable.